The band had been due to play in Delhi on Friday. They said the concert was postponed after a security barrier in front of the stage collapsed. Dozens of angry fans then raided the stage and vandalised equipment. Police said on Sunday that four executives of DNA Entertainment Network were arrested on fraud charges. Alok Mittal, joint commissioner of police in Gurgaon, near Delhi, told the AFP news agency a member of the public had made a complaint after DNA Entertainment Network refused to refund the ticket money. DNA has posted details of how to obtain refunds on its website. Reports suggest that some 25,000 people were waiting to watch the band when it was called off. The Times of India said fans then vandalised the sound systems and threw bottles at the LED display screens. Organisers tried to rearrange the show for the following day but were unable to get the required permit in time. The band issued a statement saying they were "notified that there was a serious question as to whether the show could proceed with regard to the safety of the concert audience". "And our first and foremost concern is always for the safety of you, the fans," they said. "Once we, along with DNA, the promoters of the show, determined that there was a failure of a security barricade in front of the stage that could not be adequately repaired, the promoter reluctantly announced the postponement of the show until Saturday. "Unfortunately, on such short notice the promoters were unable to secure a permit for a show on Saturday." 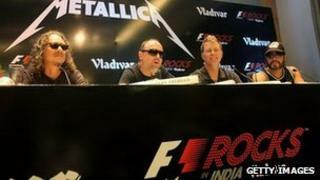 The concert was due to be Metallica's first show in India and was timed to tie in with the inaugural Indian Formula One Grand Prix. The group are due to play in Bangalore on Sunday.